CAAMFeast 2017 honorees with CA State Assemblyman Evan Low. 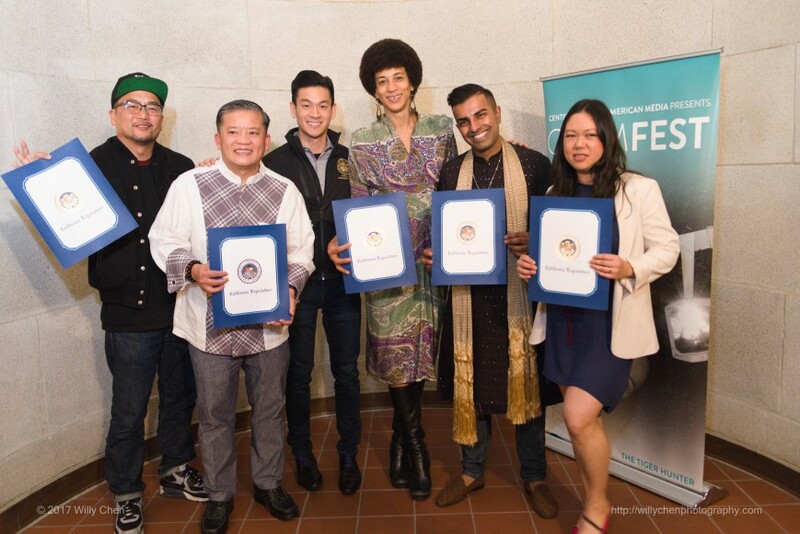 L-R: Chef Roy Choi; Chef Khai Duong of Asian Chefs Association and Khai Restaurant; Evan Low; Jocelyn Jackson, Saqib Keval and Sita Kuratomi Bhaumik of The People's Kitchen Collective. Photo by Willy Chen for CAAM. 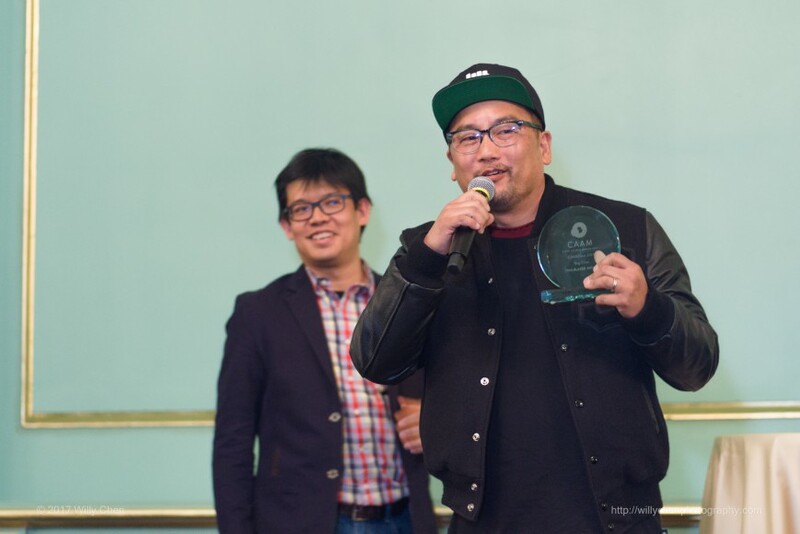 Roy Choi accepts the "Trailblazer" award at CAAMFeast. Photo by Willy Chen. Chef Khai Duong of the Asian Chefs Association and Khai Restaurant. Photo by Willy Chen. The People's Kitchen Collective. Photo by Willy Chen. Natasha Zouves of ABC7 emcees the evening. Photo by Willy Chen. 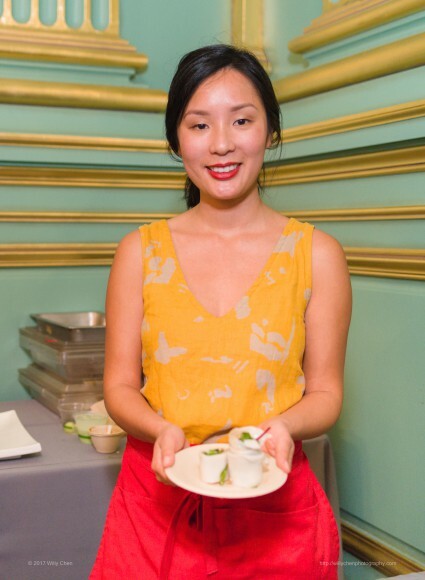 Valerie Luu of Rice Paper Scissors. Photo by Willy Chen. Garlic noodles from Swamp. Photo by Willy Chen. Hodo Soy. Photo by Willy Chen. 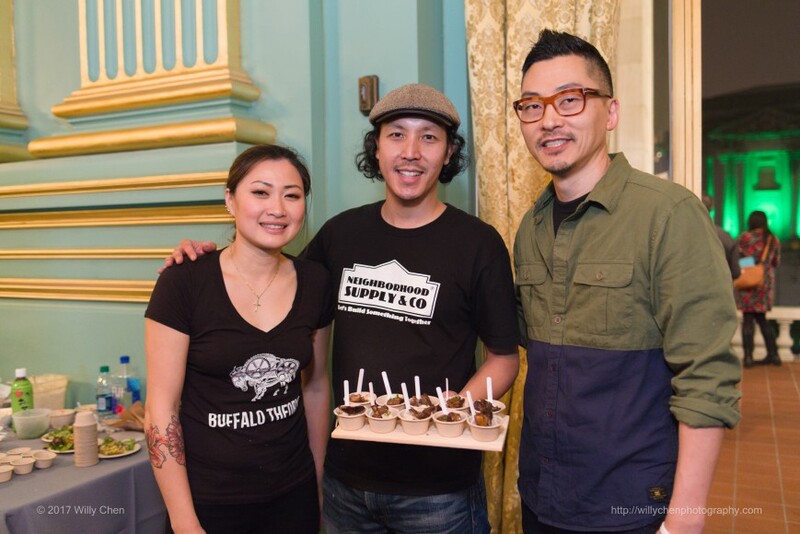 Buffalo Theory, with Chef Tim Luym (middle), a CAAMFeast alum. Photo by Willy Chen. CAAMFeast 2017 attendees enjoy the live auction. Photo by Willy Chen. 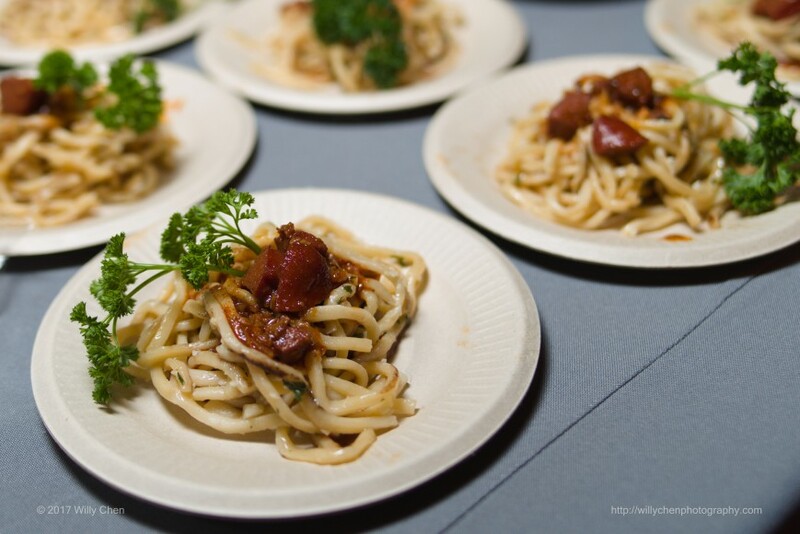 The awards night and fundraising gala celebrates talented food makers who have made unique contributions to the culinary landscape. Saturday evening marked the Center for Asian American Media’s fourth annual CAAMFeast Awards: Stories, Food and You. 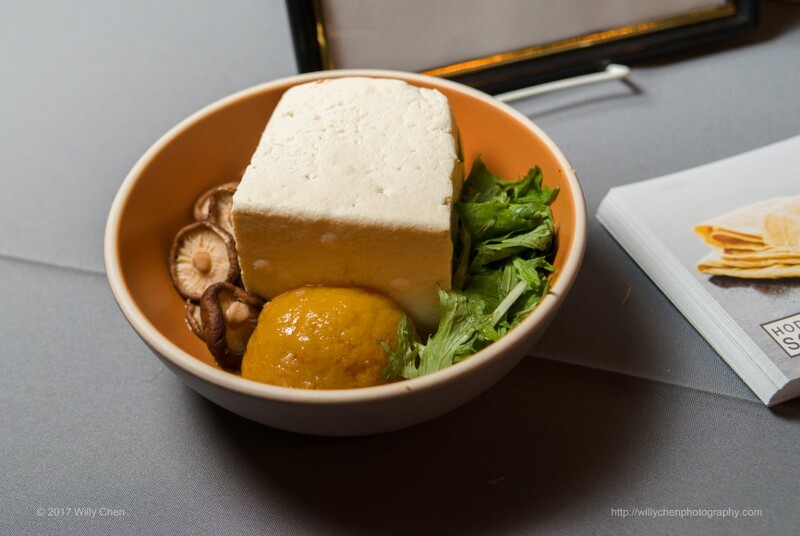 In addition to kicking off the CAAMFest season, this awards night and fundraising gala celebrates talented food makers who have made unique contributions to the culinary landscape. Attendees gathered for the festivities at San Francisco’s War Memorial & Performing Arts Center in the Green Room. Guests were abuzz with excitement. “Last year was so fun, I just had to come back,” said attendee Cheong Yong right before the doors opened. CAAMFeast honored “L.A.’s son” Roy Choi, awarding the Trailblazer Award in recognition of his long and varied list of culinary accomplishments including his L.A.-roaming Korean Mexican taco truck, Kogi Korean BBQ and recently his community-focused fast food project, LocoL. Oakland-based People’s Kitchen Collective (PKC) received this year’s Advocate Award. Comprised of three activist chefs, Saqib Keval, Jocelyn Jackson, and Sita Kuratomi Bhaumik, PKC creates food events and community meals that nourish bodies, minds and social movements. Their work seeks to honor and build upon legacies of community power and resilience. The Asian Chefs Association (ACA) was the recipient of the Visionary Award. 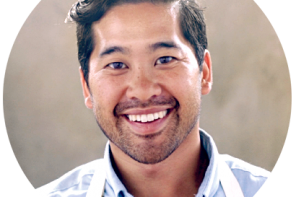 Since 2002 the ACA has been celebrating Bay Area Asian and Asian American chefs, promoting industry mentorship opportunities and giving back to the community through charitable work. Assemblymember Evan Low noted the confluence and intersection of film, media, food and activism. “It is important to demonstrate support for our communities’ many talents,” Low said. Another evening highlight was, of course, the food. 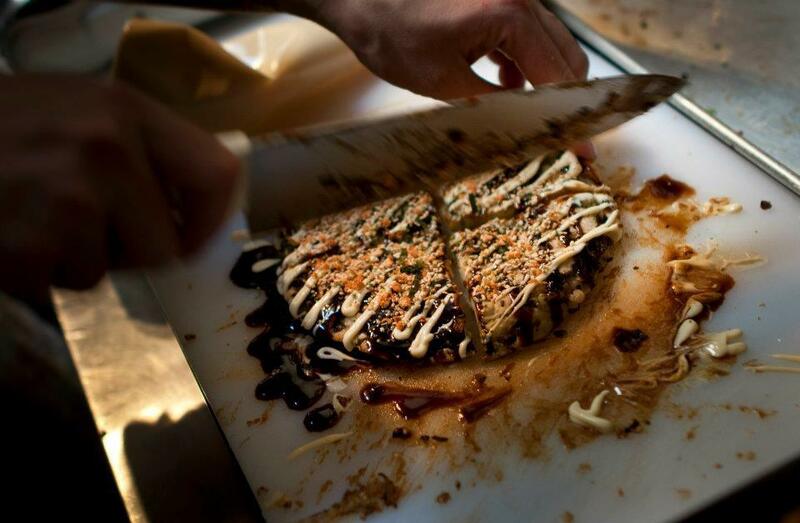 There were sweet, savory and spicy tastings and bites from top Bay Area food purveyors, as well as specially-crafted drinks and cocktails. Some attendees left the event with more food, special trips and occasions to look forward to as a result of a live auction. 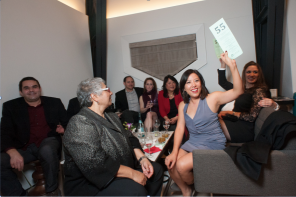 All proceeds from the night will support CAAM’s legacy and future as the nation’s leading Asian American media arts organization committed to telling the stories of our communities. For more photos, please visit our CAAMFeast 2017 photo album.